Two levels of exhibition galleries are grouped around a courtyard; applied arts on the ground floor behind a sandstone front, and painting upstairs with a facade incorporating two sizes of brick 'for the sake of enlivenment'. The tower was added for aesthetic reasons and contains storage space. This building, traditional, of Scandinavian influence yet functional in plan, was roundly criticized by the functionalist architects of the Nieuwe Bouwen. In 1972 the museum was extended with a large flexible exhibition wing designed by Alexander Bodon. Set on the garden side of the museum, on axis with the garden, is a pavilion for the Van Beuningen-De Vriese collection of objects for everyday use. The open, glass addition contrasts with the introverted brick elevations of the existing building. Its dominant feature otherwise is the silver-grey of the aluminium of the structural elements, window and door frames and characteristic slat-like sunbreak overhangs. The symmetrical pavilion, which at present houses the museum restaurant, has a rounded south facade. The washroom annexe was designed by Atelier Van Lieshout. 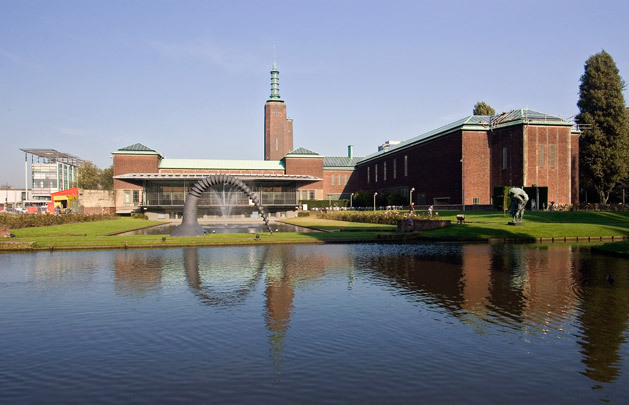 The demolition of a villa on Westersingel enabled the Boijmans Van Beuningen Museum to realize another extension by the Belgian architects Robbrecht and Daem. In the courtyard one can find an original call box designed by Brinkman & Van der Vlugt.